We report results from the second annual screening round (T1) of Manchester’s ‘Lung Health Check’ pilot of community-based lung cancer screening in deprived areas (undertaken June to August 2017). Screening adherence was 90% (n=1194/1323): 92% of CT scans were classified negative, 6% indeterminate and 2.5% positive; there were no interval cancers. Lung cancer incidence was 1.6% (n=19), 79% stage I, treatments included surgery (42%, n=9), stereotactic ablative radiotherapy (26%, n=5) and radical radiotherapy (5%, n=1). False-positive rate was 34.5% (n=10/29), representing 0.8% of T1 participants (n=10/1194). Targeted community-based lung cancer screening promotes high screening adherence and detects high rates of early stage lung cancer. The National Lung Screening Trial (NLST) demonstrated a 20% reduction in lung cancer–specific mortality with annual low-dose CT (LDCT) screening of high-risk ever smokers compared with chest X-ray.1 A key requirement for screening implementation is to ensure services are accessible to those at greatest risk. In Manchester, we developed a community-based ‘Lung Health Check’ (LHC) approach to target high-risk smokers in deprived areas. LHCs were nurse-led and included calculation of lung cancer risk using the PLCOM2012 risk model. Those at higher risk were eligible for annual LDCT screening over two screening rounds. There was a high prevalence of lung cancer detection at baseline (T0; undertaken June to August 2016) (3%); most cancers were early stage (80%) and therefore radically treatable.2 Here, we report the results of the second screening round (T1; undertaken June to August 2017). A description of the screening pilot has previously been published.2 In brief, ever smokers aged 55–74 at participating general practices (n=14) were invited to a LHC; this consisted of 6-year lung cancer risk calculation (PLCOM2012),3 symptom assessment, smoking cessation advice and spirometry. Individuals at higher risk (defined as ≥1.51% over 6 years) were offered annual LDCT screening. All LDCT scans (Optima 660; GE Healthcare) were reported by National Health Service (NHS) consultant radiologists with an interest in thoracic radiology and classified as either negative, indeterminate or positive. Pulmonary nodules were managed in accordance with British Thoracic Society (BTS) guidelines adapted for an annual screening programme.4 Indeterminate scans required surveillance imaging at 3 months and positive scans had findings concerning for lung cancer requiring immediate assessment in the rapid access lung cancer clinic based in a specialist centre. A false positive was any screened individual referred to the lung cancer clinic who was not diagnosed with lung cancer. An interval cancer was defined as any lung cancer diagnosed outside of screening before the second-round scan (T1). Volume doubling times (VDTs) were calculated in accordance with BTS guidelines.4 VDT was estimated in those without a nodule at baseline (T0) by assuming the nodule appeared the day after the CT scan was performed and measured 1 mm. Lung cancers were managed in accordance with national guidelines.5 The seventh edition of TNM lung cancer staging manual was used.6 In this paper, the first screening round is referred to as T0 and the second screening round 12 months later as T1. Individuals with an indeterminate scan at T1 had a further LDCT scan 3 months later, which we refer to as the ‘3-month surveillance’ scan. Ninety per cent of those eligible had a T1 scan (June to August 2017) (n=1194/1323). Non-attendees were significantly more likely to be current smokers (63.6% vs 50.6%, p=0.005), but there was no difference according to deprivation (p=0.79) (table 1). The majority of T1 scans were ‘negative’ (92%, n=1099) (figure 1); 71 were ‘indeterminate’ of which 84.1% (n=58/71) were for nodule surveillance. The 3-month surveillance imaging rate was significantly lower than T0 (6% vs 13.7%; p=0.0001); six individuals were reclassified positive after 3-month scans. Overall, 30 scans were ‘positive’ (2.5%, n=30/1194)—one patient declined assessment. Of 29 individuals seen, 19 were diagnosed with lung cancer and 10 were not. The false-positive rate was 34.5% (n=10/29), which represents 0.8% of T1 participants (n=10/1,194). This false-positive rate was significantly lower (p=0.0001) than T0 (corresponding values 48.1% and 2.8%) and over both screening rounds it was 44.5% and 3.5%, respectively. There were no interval cancers between T0 and T1. Diagram showing flow of participants through the screening service. LDCT, low-dose CT scan; MDT, multidisciplinary team. The incidence of lung cancer in T1 was 1.6% (n=19/1,194), 79% were stage I (n=15), 10.5% stage III (n=2) and 10.5% stage IV (n=2) (table 2). Pathological subtypes included adenocarcinoma (32%, n=6), squamous cell (21%, n=4), small cell (16%, n=3) and non-small cell lung cancer not otherwise specified (10.5%, n=2). A clinical diagnosis was confirmed by the multidisciplinary team in four cases without pathological confirmation (21%). Cancer treatments included surgery (42%, n=9), stereotactic ablative radiotherapy (26%, n=5) and radical radiotherapy (n=1) (table 2). One individual had surgery for a benign lesion (granulomatous disease). There were no deaths within 90 days of surgery. 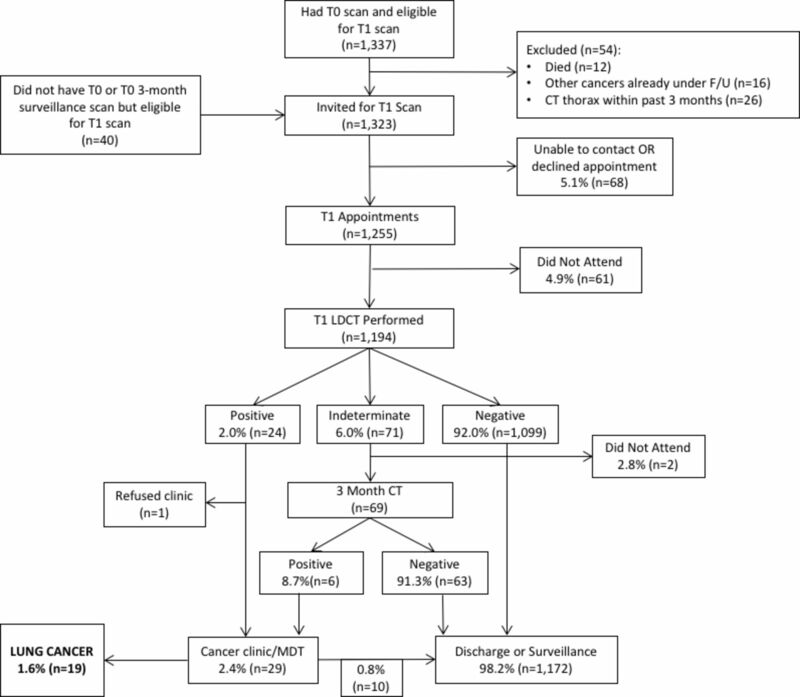 Thirteen individuals with a negative baseline scan (T0) were diagnosed with lung cancer in the second round; after retrospective review, five were visible at baseline as sub-5 mm nodules and all were stage I at diagnosis (table 2). The T0 false-negative rate was therefore 0.4% (n=5/1337), negative predictive value 99.6%, sensitivity 89.4% and specificity 97.1%. The benign surgical resection rate over both rounds was 2.5% (n=1/40). Tumour VDT was highest in those with a true negative baseline scan (average 49±26 days), followed by false-negative (99±50 days) and indeterminate scans (297±215 days; p=0.009) (table 2). In this paper, we report results from the second round of the Manchester ‘Lung Health Check’ pilot, a targeted lung cancer screening service based in deprived areas of Manchester. Screening adherence was high (90%) despite most participants being from the lowest decile of deprivation in England, emphasising the benefit of accessible community-based services. The incidence of lung cancer was 1.6% (n=19), most cancers were stage I (79%) and 89% of individuals with screen detected cancer were offered curative-intent treatment. Over both screening rounds, 4.4% of the cohort were diagnosed with lung cancer, equivalent to one cancer detected for every 23 people screened. This is high when compared with other studies and more than 2.5 times that seen in NLST (T0: 1.0%, T1: 0.7%) and NELSON (T0: 0.9%, T1: 0.7%).1 7 Our benign surgical resection rate was low at 2.5%, 10-fold lower than NLST and NELSON.1 7 The pathological confirmation rate and surgical resection rate are lower than reported in other trials. The exact reason for this is unclear but may be a consequence of higher deprivation and increased comorbidity in our population. When reviewed retrospectively, five cancers diagnosed in the second screening round were present on baseline CT, and all were sub-5 mm solid nodules and therefore appropriately classified as negative in accordance with BTS guidelines .4 In all five cases, the cancers were stage I when detected, although with VDTs ranging from 51 to 163 days, there may have been a stage shift if we had adopted biennial rather than annual screening. This was also true for cancers that developed in individuals with true negative baseline scans; the estimated mean VDT of 49 days in this cohort suggests a more aggressive phenotype. In conclusion, we have demonstrated that a targeted community-based lung cancer screening programme, delivered within the NHS, can engage those most at risk and detect a high proportion of curable early stage lung cancers. The Macmillan Cancer Improvement Partnership facilitated the design and development of the pilot. The service was delivered by the lung cancer team at Wythenshawe Hospital, Manchester University NHS Foundation Trust, in partnership with Alliance Medical. LDCT reporting was performed by a consortium of NHS consultant radiologists with subspecialty interest in thoracic medicine. The pilot service was commissioned by South Manchester Clinical Commissioning Group on behalf of the three Manchester Clinical Commissioning Groups. Community engagement was delivered by multiple members of the team and was led by MCIP and the Manchester CCGs in conjunction with Manchester City Council, Macmillan Cancer Support and BHA for Equality. This work was supported by the NIHR Manchester Biomedical Research Centre.
. The revised TNM staging system for lung cancer. Ann Thorac Cardiovasc Surg 2009;15:4–9. Contributors Service concept: RB, PAC, PVB, AT, JT. Service development by members of the Macmillan Cancer Improvement Partnership: JT, ZK, GH, CH, PVB, MA, VB-B, JE, DM, JF, MS, AM, MO’L, RP, JP, LY, AT, PE, DC, ST, RB, PAC, ES, DK, BT, DC, ST. Service operation and delivery by the Manchester University NHS Foundation Trust lung cancer team: HB, ME, JL, TE, JK, SMan, AWal, RD, MG, RS, AS, ES, PVB, PAC, RB. Radiology reporting by the radiology consortium: RD, MG, JH, KI, DK, SMel, TN, RS, NJS, AS, ES, BT, AWat, JW. Analysis of data and drafting of manuscript: PAC, HB, ME, JT, RB and guarantors of overall content: PAC, RB. Review, revision and agreement of final manuscript: all authors. Funding The pilot was supported by funding from Macmillan Cancer Support.